Keeping a bird outside a cage is not recommended unless a parrot safe bird room or aviary is implemented. Each bird is different with their own personality and habits, which may change depending on your availability to spend time with them. Some birds develop unwanted behaviors when their needs are not met. Having an exotic bird in your home requires patience, flexibility and commitment. When unsupervised, secure bird in ONE bird-safe room to maintain control over environment. No paint, paint thinner, chemicals, plastic bottles, spray bottles, aerosol cans, cleaning supplies, dirty trash, etc. within reach of bird. Check outside for scary things (gardener, carpet cleaner, handyman, hawks, etc.). If noticed, close blinds or shades so that bird can hide. Know what’s happening in your neighborhood. If there is something that causes fumes, make sure windows are closed. Open screened window slightly less than width of bird’s shoulders. Best if perch is not directly in front of window. If scared, macaws can push through screens to escape perceived danger. Identify lingering fumes in home from ongoing or completed projects. Place towel under door, make sure bird room is ventilated and hepa filter is on. 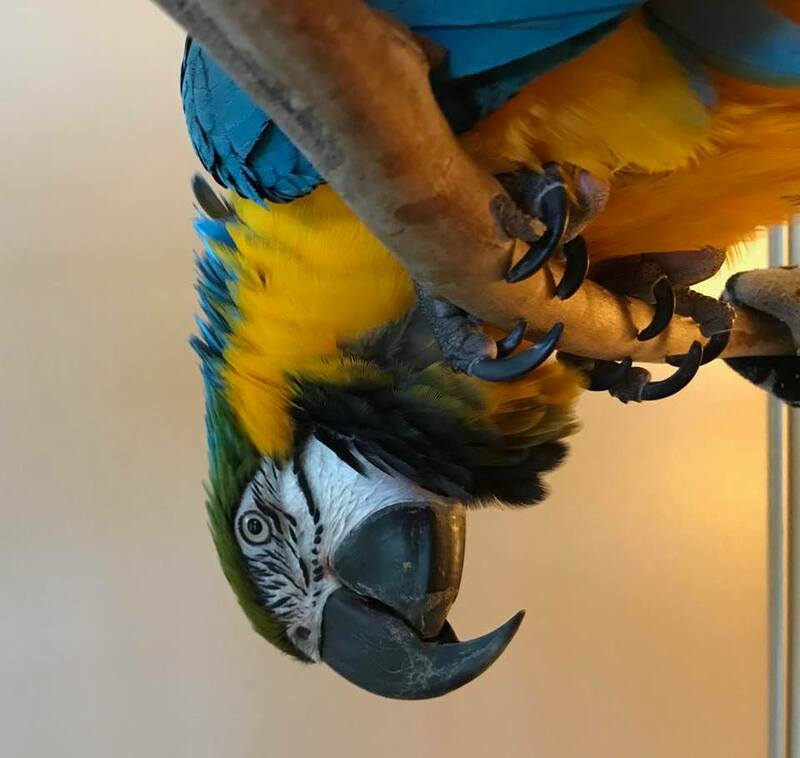 If he/she likes to chew an area, cover it with a towel, move the perch away from the area or mount a piece of wood for chewing in front of it, blocking the problem area. If bird finds comfort in confined areas, this is nesting behavior. Block access. Unsupervised for long periods of time, this type of behavior can stimulate ovulation, which often comes with complications requiring veterinary care. Check body language of bird. If nervous, spend some time with your bird before you leave. A few minutes of petting, allowing him/her to feed you and a kiss will give her a sense of calm when you need to leave. In the kitchen, immediately cover cooling burners with a frying pan lid to avoid exposure to hot surfaces that could be mistakenly used for landing if bird is startled. ventilate and keep your bird away from the area for at least 3 days.